The iPhone may fit and your pocket, and the iPad may not be much larger than a hardcover book, but FileMaker thinks it can squeeze an entire database application on both devices. On Tuesday, FileMaker will roll out two mobile versions of its database application for iPhone and iPad users. And while you won’t be able to create databases on those devices with FileMaker Go, you will be able to work remotely with FileMaker Pro databases on your mobile device, viewing, editing, and searching information from wherever you are. “The thing that’s cool [about FileMaker Go] is not that we’ve done it, but how we did it,” Ryan Rosenberg, vice president of marketing and services for FileMaker, told Macworld. While the mobile app can’t do everything its desktop counterpart can pull off, Rosenberg says, it’s still a pretty full-featured version of FileMaker. To that end, FileMaker Go for both the iPhone and iPad can run most databases created in FileMaker Pro 7 or later, with no customization required. Layouts, lists, forms, and tables look the same on a mobile device as they do on the desktop. FileMaker Go also supports most scripts used in desktop databases. With FileMaker Go, you can access databases stored on a Mac or PC using either a local wireless network or a Wi-Fi or 3G connection. (Database hosting requires version 10 or 11 of either FileMaker Server or FileMaker Pro.) When you connect with databases via a network connection, any changes you make remotely are reflected in the stored database instantaneously—and vice versa. 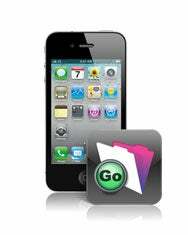 In addition, you can use File Sharing in iTunes to copy databases from your desktop onto your mobile device for use with FileMaker Go. You can download databases via e-mail as well, using the Document Support feature in iOS 4 (and iOS 3.2 on the iPad) to open Mail attachments directly in FileMaker Go. Users can also download databases from Websites or file-sharing services, Rosenberg says. Users can do just about anything with FileMaker Go that they can do with the desktop version of the database app—add or change data, navigate through records, switch between layouts, and open new windows. The mobile app supports such familiar FileMaker features as Quick Find, Web Viewers, External SQL Data Sources, containers, and portals. But FileMaker also built its mobile offering with iOS-specific features in mind. FileMaker Go supports touch gestures—pinching, swiping, and tapping—to manage data. 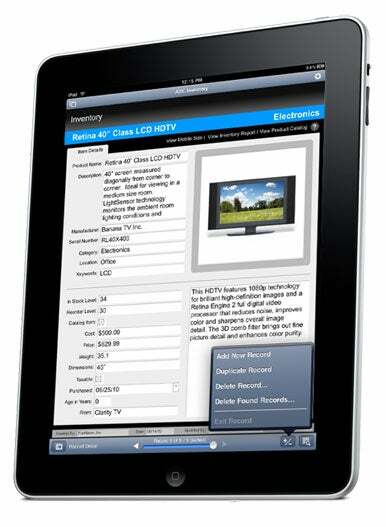 Users can access value lists and, with a tap, fill in fields, minimizing the amount of typing they have to do with the on-screen keyboard. Both iPad and iPhone versions work in either portrait or landscape modes. “You can have a large database, but it doesn’t matter because you can search and sort and find what you’re looking for when you’re out on the road or around the building,” Rosenberg said. FileMaker Go for the iPhone costs $20, while the iPad version costs $40. The iPhone version runs on any iPhone or iPod touch running iOS 4, while the FileMaker Go for the iPad runs on all of Apple’s tablets. Both applications should arrive on the App Store Tuesday.